Fuyang, a district in the southwest suburb of Hangzhou, is hoping that urban-rural integration will bring more vitality to its villages. On March 23, a meeting in Banshan Village brought urban and rural families together. The event was aimed at promoting Fuyang’s local resources, including farm produce, fruits and tourism, and its She minority culture. A total of 570 households have been selected from 1,200 candidates to represent Fuyang online. Urban families may choose to establish a relationship with a certain household and enjoy their catering and accommodation services at lower prices. At the same time, a photography contest, food festival, bicycling tours, theatrical performances and trade fairs are to be held throughout the year to attract more tourists and investment to the area. “Up till now on our WeChat applet, 120 Fuyang households have received over 150 invitations from urban families,” Zhong Yiyuan, chairperson of Fuyang Women’s Federation, told Shanghai Daily. Zhong said the event was primarily not to make profits. “Our villagers, a great number of housewives and the elderly, are eager to meet new people and get updates from the outside. On the other hand city people nowadays are tired of package tours, they want to experience local lives and culture. So what we do is just matchmaking,” she said. In the long run, she hoped these families could be friends, and regular contact between the two sides could help boost local incomes. Villager Chen Haining, 58, said he was not thinking that far ahead. “I just hope that we will be like one family,” he said as he shook the hand of his new “family member,” Zhang Weilin, who works at an IT company in west Hangzhou. Zhang said he found the natural environment in Fuyang alluring. Chen says he profits mainly from growing peaches. He and his wife live in a three-story building as most other villagers do, and have a 2-hectare peach tree patch on the hill. Their son and daughter both work in Hangzhou and visit once a week. “Most of our villagers are over 50, very few young people now. So I’m just happy that I have got a young kin,’” Chen said. Retired Hangzhou lawyer Su Diya said that, apart from tourism, urban citizens could do more for the development of rural areas. He had chosen to join an extended She minority family living in Shuangjiang Village. Shuangjiang is the only minority village in Fuyang and the nearest She minority settlement to Hangzhou. In its population of over 1,000 people, about 35 percent are She people, noted for their singing, dancing and traditional craftsmanship. 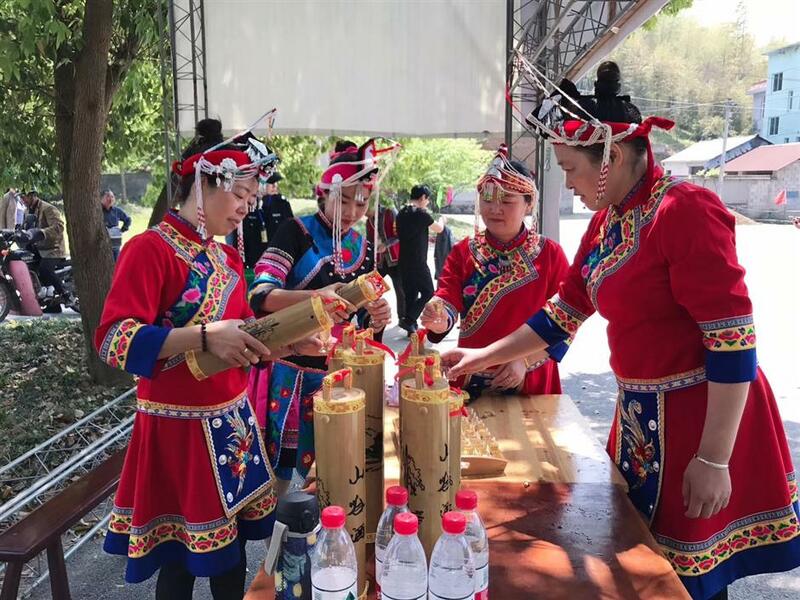 “Many people have heard of the Jingning She Autonomous Prefecture in Lishui City, Zhejiang, but not so many are aware that we have She people here just an hour’s drive away from Hangzhou,” said Su. He thought he could use his expertise to help villagers in contract reviewing, especially those engaged in e-commerce, as novice sellers could fall victim to online fraud and unfair competition. A group of heads from professional associations in Hangzhou have paired with a quiet and hidden village named Jiaoshanwu not far from the S05 expressway. Wu Jiyi, secretary-general of the Zhejiang Artificial Intelligence Association, saw possibilities in getting village produce equipped with frontier technology. Fuyang natives working in cities are also finding their own ways to give back and participate in the development of the countryside. During interviews in the village, Shanghai Daily heard the word xiangxian (乡贤) several times, literally a village sage and usually a reference to the educated and wealthy gentry of a certain area. “They’ve got talent, they’ve got money, and they are also willing to repay the town where they were born,” said Shao Gangfeng, an expert in rural development in the Yangtze River Delta region. According to Shao’s research, such people had been deeply involved in the establishment of modern education and medical facilities throughout China’s history. Local She minority groups celebrate the ancient Chinese Shangsi Festival, which falls on the third day of the third month of the Chinese lunar calendar. Xia Lin, who was born in Xiangxi Village, is what people call “an urban elite.” She and her elder sister both have senior management positions in Hangzhou but their parents still live in the village. 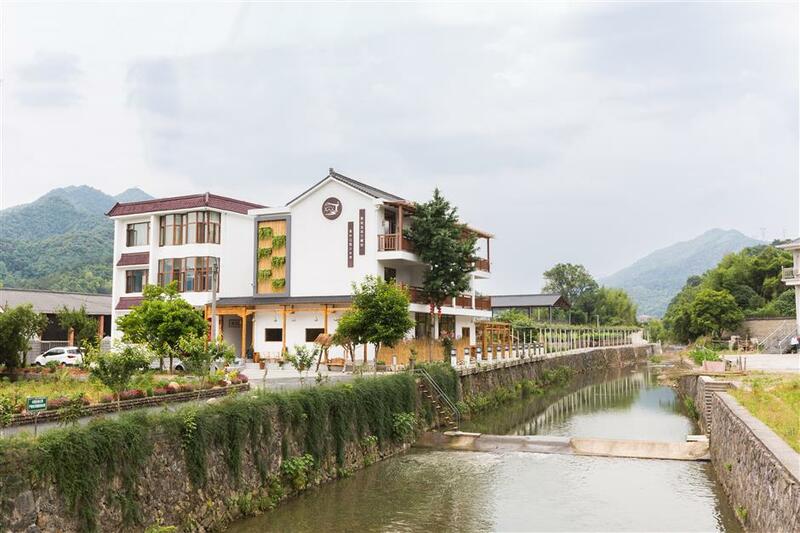 In 2015, Xia transformed the family’s factory into an upmarket village homestay for travelers. “The factory used to produce plant extract. Starting from 2014, local government began to demolish boilers in town. So it had to stop operation,” Xia said. At that time, she was already back from studying in the United States and had started her own company in Hangzhou. Her father retired from the position of the village head and the idea of opening a homestay emerged. After two years’ of renovation and interior furnishing, the village homestay opened in 2017. The business also provides jobs for local people. The homestay has hired several workers to grow vegetables, help with the catering and to clean. Guests are offered a variety of local experiences including picking blueberries, peaches and Chinese bayberries on nearby farms, directly fueling the grow of related industries. At Jiaoshanwu, changes are taking place quietly. Urban returnees are sponsoring the “Neighbor’s Festival” in the village for a second year. Wang Fu’er, chairperson of the local Women’s Federation said it is building bridges between villagers and city dwellers. 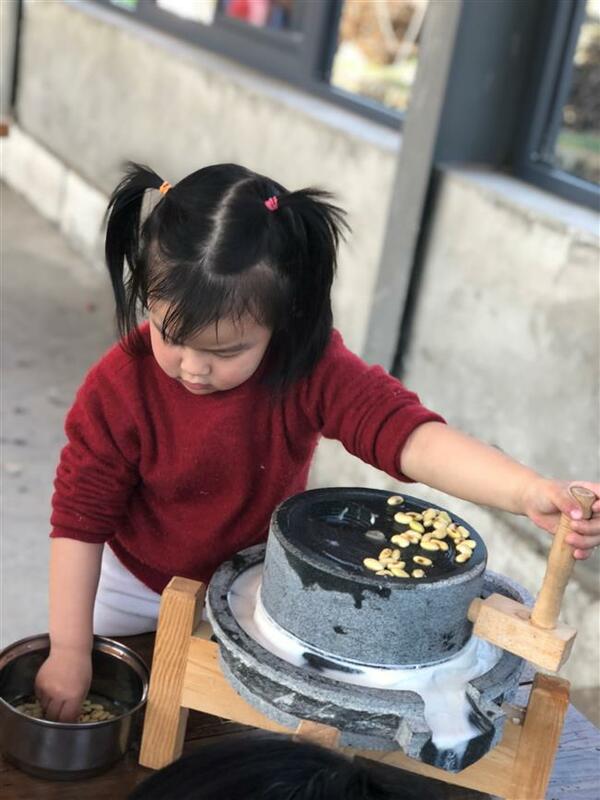 A child learns how to make soybean milk at the homestay.